4 years ago when I participated in my very first Relay for Life after my cancer diagnosis, I met a wonderful lady, a breast cancer survivor, who told me her story as we walked the survivor lap. Part of that story was about how she and her son got matching tattoos the day she heard the words “no evidence of cancer” as a tribute to her winning the battle. That really struck me and I thought that was the perfect way to commemorate the journey. Fast forward a bit to when I learned more about my form of cancer and the fact that it will likely be YEARS before I ever get a remote chance of hearing those words. 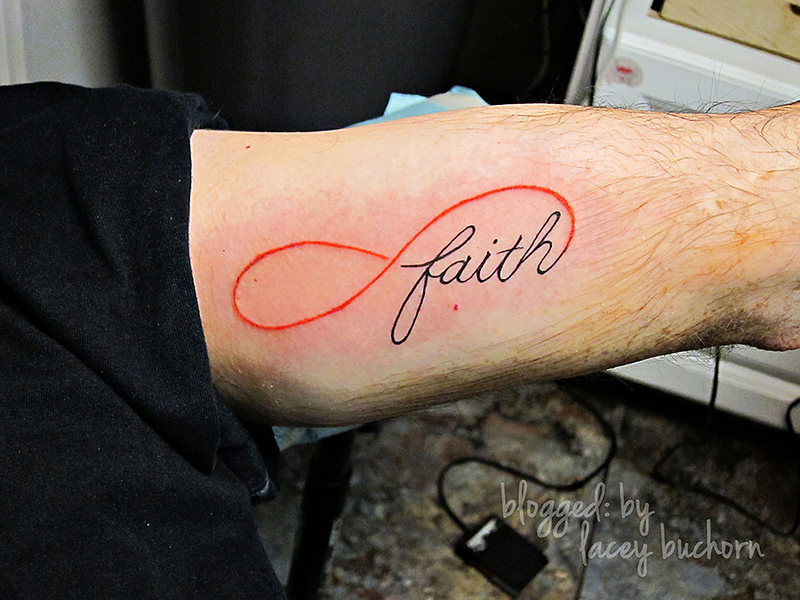 Instead I decided that I would get a tattoo to signify my continuing battle and the faith that holds me together. 4 years later, I finally decided on a design. 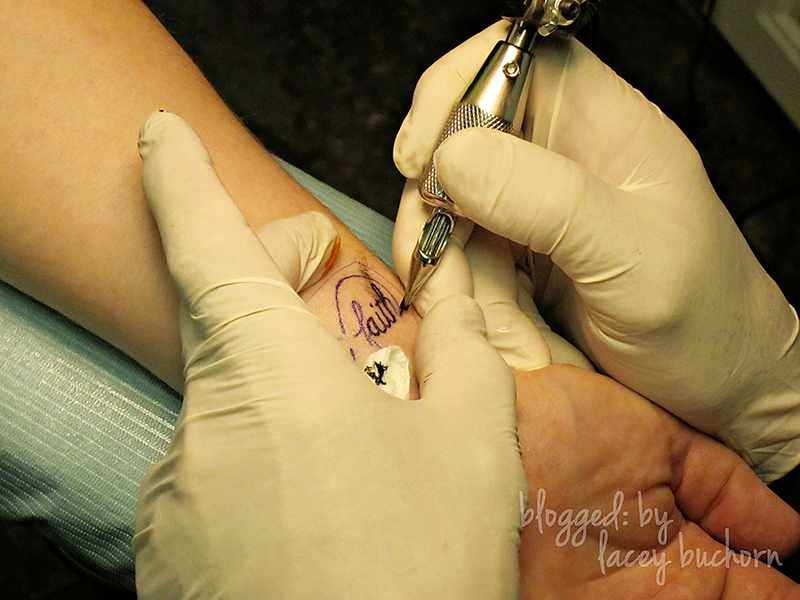 I like *most* ink, but on my body I am super picky about design and location. I have always wanted 3 tattoos and already have 1 on my lower back, a tribute to Jacey (no, it is not a tramp stamp…I despise that term). The other 2, I wanted on my inner wrist and the top of my foot. Since these were in locations that are visible almost 100% of the time (I live in flip-flops) the design choice was even more important. I found this design on the internet and fell in love. 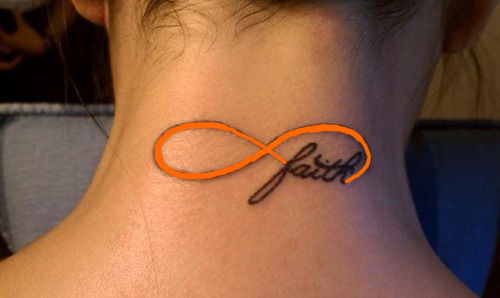 Simple but meaningful….never-ending faith. I altered it slightly to match my battle (excuse the rough mock up, it was only for my tattoo artist to draw his template from). Orange is the awareness color for leukemia and while I often ask God why I couldn’t have at least gotten a “pretty” color (silly, I know), it is a part of my battle. Bryan was in New York, while I was making these final design choices, so he was constantly slammed with pictures via Skype. He shocked me one day though, by saying he wanted to get the tattoo as well. I know, I know….couples shouldn’t get matching tattoos…blah, blah….I guess I shouldn’t tell you the plan for my foot then :). 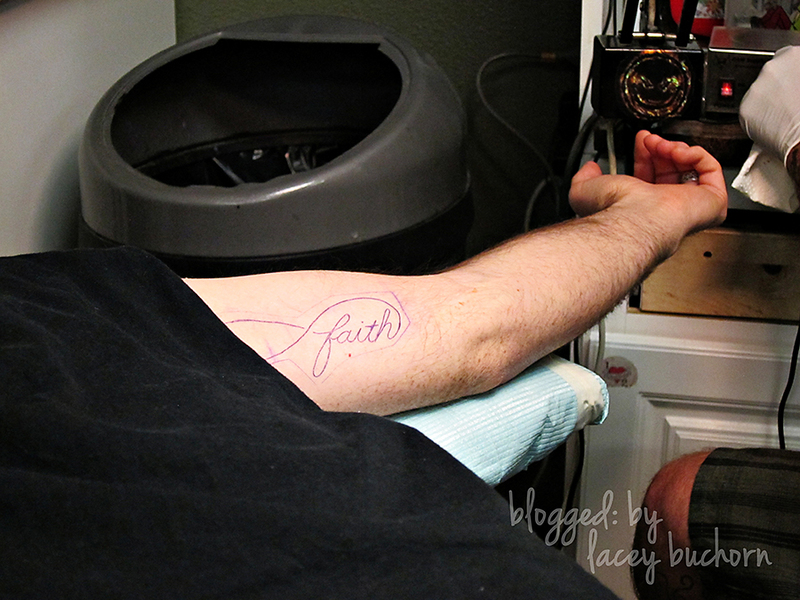 We had to change our appointment twice, because Bryan’s TDY kept getting extended, but on Saturday, April 21st, Bryan and I got inked by Uncle Eddie at IronHorse Tattoo down by UNLV. My stylist has a beautiful sleeve, so I went with her personal recommendation since we have no experience with any artists here in Vegas. 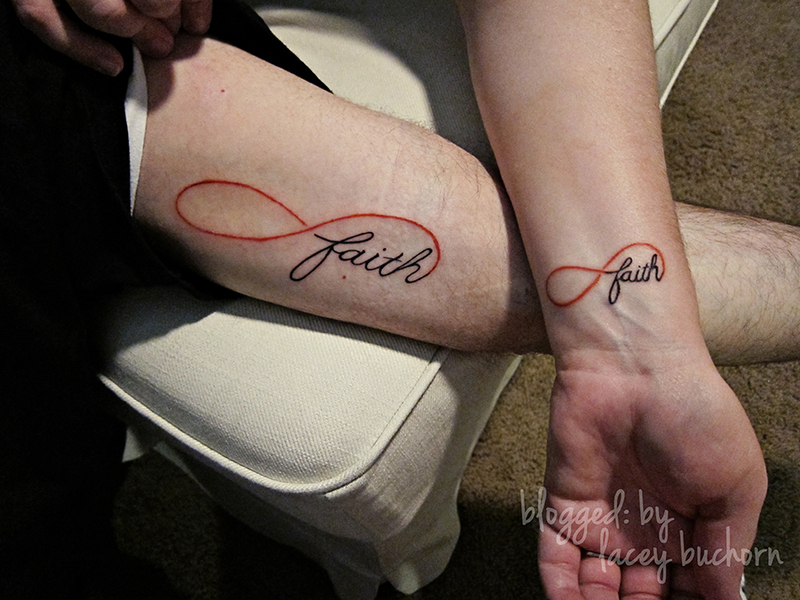 I had decided on my inner left wrist and Bryan decided on his upper left inner arm. Probably not the greatest choice for a first tattoo (for Bryan) but that is where he wanted it. He asked Uncle Eddie about the pain factor there and Uncle Eddie held up his arm and said, “notice where I am NOT tattooed”….LOL! I was super worried being on my wrist it was going to hurt, especially after how back my back did, but it didn’t at all. It was more like an annoying scraping than anything else. Uncle Eddie was also super great about making jokes (and a little making fun of you) to ease the anxiety. Bryan admitted that it very definitely did hurt. He persevered though. We both love them and I am very touched that Bryan did one too. He is an integral part of my battle, but I never expected him to plaster “me” on his body. 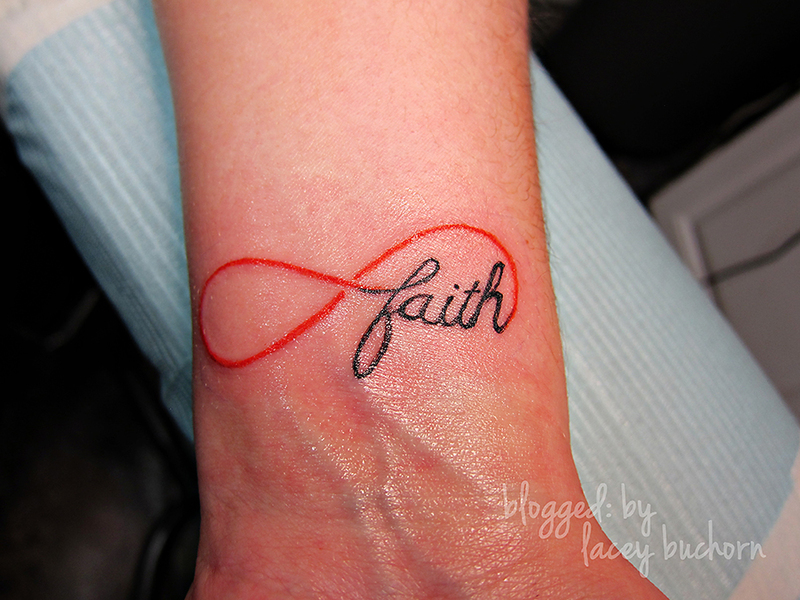 Jacey, my child who hates needles wants a matching one when she turns 16 now (when you can legally get tattooed in NV). While we have a long ways to go till 16 and she is likely to change her mind before then, if she still wanted one at that point, I can’t say I would tell her “no”. Now, on days when I get frustrated or try to pull a pity party, woe is me day all I have to do is look down. It won’t erase those days, but it does remind me that faith will get us through. Here is a quick video I threw together. 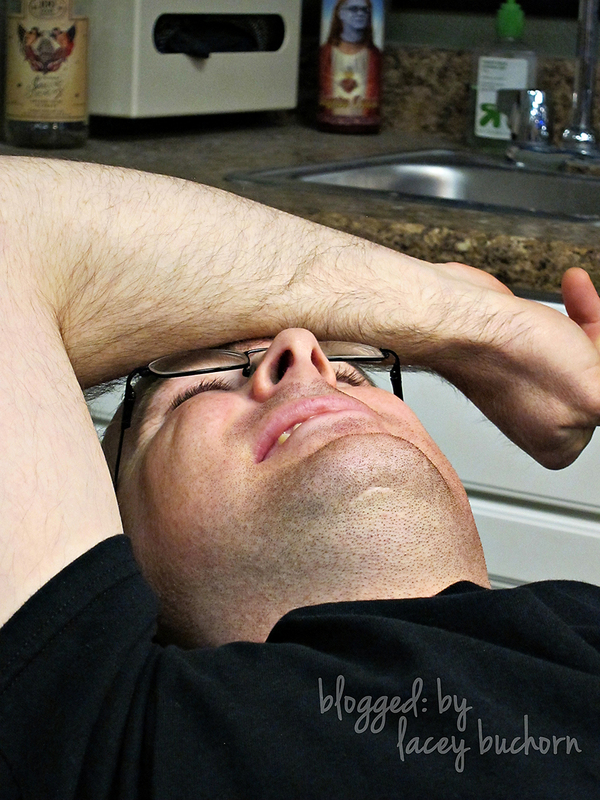 Note what Bryan says about a minute in…I am truly blessed. Any man who can say that about his wife while going through pain is a keeper! This is so beautiful! The video made me cry. I love the tattoo, I am also very picky about what I want as a tat, but you chose one of the best. I will pray that your cancer is cured keep on fighting!